A Copilot (previously called "Wingman") is another user who has delegated access to your account. No need to hand over login credentials! What is a Copilot and what are the different types? Copilot is a role that can be granted to any user whether or not they are on the policy or on the domain. You can assign a Copilot by going to in Settings > Your Account > and scroll down to Copilot: Delegated Access. 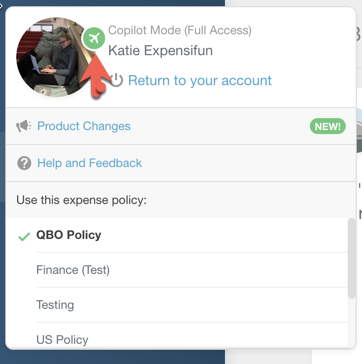 The Copilot feature allows you to give someone else delegated access to your account. From their own Expensify account, they will be able to access your account and take actions like adding expenses and creating, submitting and approving reports on your behalf (depending on the permissions you allow). 2. Submit Only Copilot - Your copilot will have the same limitations as a Full Access Copilot, with the added restriction of not being able to approve reports on your behalf. Going on vacation and need a colleague to approve reports on your behalf, but don’t want to grant them full access? Add a Vacation Delegate instead! Log into Expensify.com (you cannot set this up on the mobile app at this time). Go to Settings > Your Account > and scroll down to Copilot: Delegated Access. Enter the email address of your Copilot and select whether you want to give them Full Access (with the ability to approve reports on your behalf) or the ability to Submit Only (and no ability to approve reports). 6. 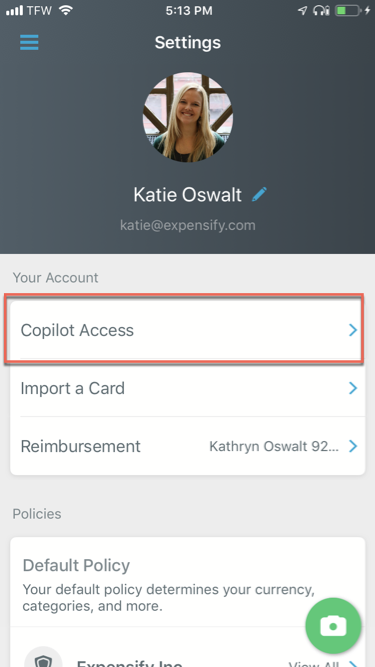 If your Copilot already has an Expensify account, they will get an email notifying them that they can now access your account from within their account as well. 7. If they do not already have an Expensify account, they will be provided with a link to create one. Once they have created their Expensify account, they will be able to access your account from within their account as well. Click the User Icon in the upper left-hand side of the page. In the “Copilot Access” section of the dropdown, choose the account you wish to access. When you Copilot into someone else’s account, the Expensify header will change color and an airplane icon will appear. 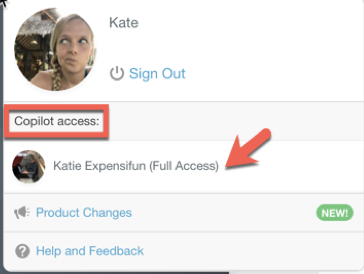 You can return to your own account at any time by accessing the user menu and choosing Return to your account. Tap on the menu icon the top left-hand side of the screen, then tap your profile icon. Tap “Copilot Access”, then choose the account you wish to access in the list on the next screen. When you Copilot into someone else’s account, the Expensify header will change color, and the settings cog will display an airplane icon. 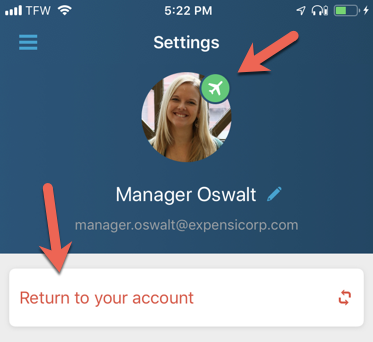 You can return to your own account at any time by tapping Return to your account. Forward any email receipt to receipts@expensify.com with only the email address of the user whose account you want the receipts to go to in the subject line. As long as you are a Copilot for this user, the receipts will be placed in their account and can be found on the Expenses page. Is a Copilot a billed "active" user? A Copilot account alone will not be billed if there is no activity taking place on any reports, but the Copilot will be billed if they take action on a report. We bill the billing owner based on activity, and any report action would make this Copilot a billable actor. My email receipt didn't show up in the intended user account! Why? Double-check that you do do have access as a Copilot to this person's account using the steps above. Is there a limit to how many Copilots can be added to an account, or a limit to how many user accounts I can access as a Copilot? Nope! There is no limit for either of these scenarios. Copilot away to your heart's desire. I'm in Copilot mode for an account. Can I add another Copilot to that account on behalf of the account holder? No--only the original account holder can add another Copilot to the account, since this is giving explicit permission for the access. I'm a Copilot of an admin. Can I add a withdrawal account for them? Yes, you can set up a withdrawal account if you are designated as a full access Copilot.